DUBAI, United Arab Emirates (AP) — Saudi Arabia will allow women into sports stadiums as of next year, the kingdom’s latest step toward easing rules on gender segregation — but they will be seated in the so-called family section, an area separate from the male-only crowd. Still, the decision, announced on Sunday, marks another incremental step toward greater women’s rights in the kingdom. The General Sports Authority described the decision as one that will allow “families” into the stadiums — a term authorities use to refer to the public spaces that accommodate women. These “family” sections are for women who are out on their own or who are accompanied by a male relative. Many restaurants and cafes, which often also have separate entrances for women, have similarly segregated seating arrangements. The authority said the three major sports stadiums in the capital, Riyadh, and the cities of Jiddah and Dammam will undergo renovations to accommodate families. The decision comes after the public appeared to welcome a decision to allow women to drive for the first time next year. 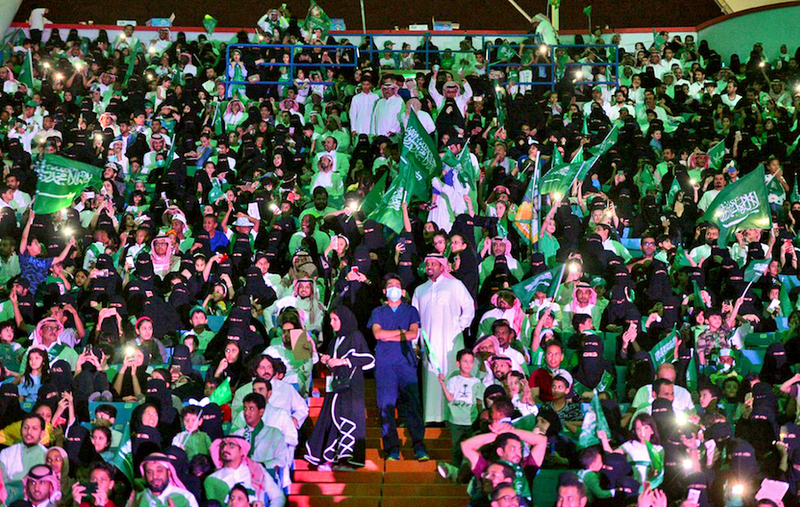 Many also responded enthusiastically when women were allowed into the Riyadh stadium for national day celebrations last month. It’s a stark reversal from years of allowing only men into the stadiums, many built with hundreds of millions of dollars when oil prices were nearly double what they are now. The government spent lavishly on the stadiums in an effort to appease its majority young population and provide spaces for fans eager to cheer on local clubs, as well as hold national parades and ceremonies. Two years ago, a Saudi woman was arrested while attending a soccer game in Jiddah’s al-Jawhara stadium, which opened to the public in 2014. Police were quoted in local media at the time as saying that security spotted her at the stadium “deliberately disguised” in pants, a long-sleeve top, a hat and sunglasses to avoid detection. Most women in Saudi Arabia cover their hair and face with a veil and all women are required to wear an abaya, a loose black dress, in public. Over the years, though, there have been some exceptions for foreign women. In 2015, an Australian female supporter of Western Sydney Wanderers soccer club was permitted to attend a match at Riyadh’s main stadium and a group of American women traveling with members of U.S. Congress watched a local club match, also in Riyadh.